People aren't the only ones getting facelifts and breast reductions. December 19, 2011, 8:56 a.m. While controversial — and often illegal — procedures like ear cropping, tail docking and declawing are nothing new in the world of pet modification, a new, ahem, breed of surgeries that you’d normally associate with your drastically nipped and tucked Aunt Beryl from Atlantic City have become increasingly popular among pet owners in recent years. Most of these procedures won’t require you to fly Princess Chubby Cheeks to Sao Paulo for a facelift or tummy tuck as many established veterinarians specialize in plastic surgery for pets. And although these procedures — we’ve listed five notable ones below — do enhance the physical appearance of your four-legged amigo, most pet-owners consider them not for reasons of vanity. Instead, pets undergo these surgeries to correct discomforting — and often fatal — health conditions (The Humane Society opposes “cosmetic and other forms of surgery on animals when done solely for the convenience or pleasure of the owner and without appropriate benefit to the animal.”). Plus, in addition to providing relief to a suffering pet, we can imagine a better method of warding off intruders than a German shepard with prosthetic testicles and braces. Although a doggy nose job might sound absurd, this procedure is much more common than you might think … and it improves, and often saves, the lives of small, congenital breathing problem-prone breeds (pugs, Boston terriers, bulldogs) with those adorable smooshed-in faces. In addition to bringing comfort to Francois the French bulldog, canine rhinoplasty can help an owner sleep easier as it helps to eliminate or at least decrease the volume of ungodly snoring from a four-legged bedmate. We’re friendly with a pooch, Oprah the pug, that’s undergone a rhinoplasty procedure and although she’s still a bit of a rampant snorter, her quality of life has increased significantly. Pooches such as shar-peis and bulldogs certainly rank high on the adorable scale but sometimes giving them kisses (or getting anywhere near their faces) can be a decidedly stinky affair as their trademark skin folds can often harbor harmful, hard-to-clean bacteria. Full facelifts in which a dog’s facial skin folds are decreased help to alleviate this problem. Post-surgery, facelifted pooches emerge happy and healthy, their wrinkly-faced charm still intact (no, they don’t come out looking like Heidi Montag). Reconstructive skin-fold procedures can also be performed around the eye, tail and vaginal areas to keep bacterial infections at bay. Used to boost Mr. Bojangles self-esteem rather than help treat any debilitating medical issues (unless you count doggy depression and post slice-and-dice trauma), Neuticles are testicular implants made from FDA-approved solid silicone designed to mimic a cojones-free canine’s former doghood, putting that unmistakable swagger back in his step (and sway between his hind legs). Invented by Gregg Miller after his own pooch, Buck the bloodhound, began to show signs of post-neuter malaise, Neuticles are inserted by a veterinarian directly following an altering procedure so that “it’s like nothing ever changed.” Now available in four models and for cats, horses and bulls (!) in addition to dogs, more than 425,000 pairs of Neuticles have been sold since 1995. Satisfied customers include Rocky Kardashian. Why are we not entirely surprised by this? 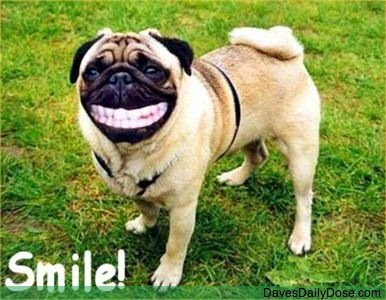 Although we’ve never personally encountered a dog wearing braces, no doubt we’d stop dead in our tracks if we did. Used more to help ease the pain and periodontal disease associated with abnormal tooth alignment (malocclusion) than for cosmetic enhancement, there is one drawback to canine orthodontics: while Harry the Hazanese is outfitted with braces, bands or a retainer (unlike human orthodontics, the gear stays in for a matter of weeks instead of years) he can’t eat hard food or gnaw away on his favorite rawhide toy. Still, a small sacrifice for emerging with a smile that looks like a million bucks (and costs around $1,000). Normally performed on rescue dogs that have been subject to extensive over-breeding, canine breast reduction procedures help to eliminate the discomfort (and self-consciousness) that comes along with prematurely sagging mammaries. And no, procedures that enhance a ladydog’s bosom fortunately do not exist. Just don’t tell that to Fred the frisky Jack Russell Terrier who has a thing for ample you-know-whats.